“Gather My saints together unto Me: those that have made a covenant with Me by sacrifice” (Psa 50:5). We have to make a covenant with our God by SACRIFICE. Every covenant we make involves making some sacrifice – a sacrifice of some comfort, pleasure or treasure. Those who do not make covenants with God, those who take life easy, cannot lay hold on greater things. They cannot go on with God. "My saints … those who have made a covenant.” Christian life begins with a covenant. At water baptism we first enter into a covenant with our God – by which the Lord becomes our God and we become His people. After that, at every stage of our spiritual life, we draw closer and closer to God by making various covenants. These we must faithfully keep till the Lord appears in His glory. Whether a man is a saint or not is proved by whether he is standing in his covenants with his God or not. It is time for the Lord to appear. 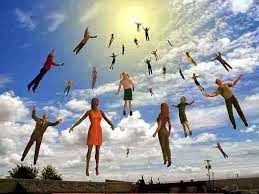 Soon we are going to hear Him announce, “Gather My saints unto Me!” Then those who have made a covenant with the Lord with sacrifice, those who have been true to it till the end, will be gathered into His eternal Home. O child of God, will you be in that group?